It’s well documented that DIY knowledge amongst young men is at an all time low with high numbers more than happy to call in an expert, rather than tackle the job themselves. In many instances, the jobs would fall outside the scope of the average DIY’er but armed with the Internets source of helpful information, read how one homeowner recently amazed himself and saved a fortune in call out charges too. “My tool kit is non-existent and aside from painting and wall papering, I’ve never been inclined to attempt anything more complicated than changing a mains plug. 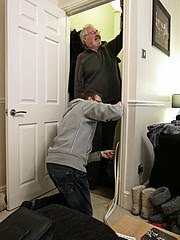 However, with everyone tightening their belts, and an onslaught of several ‘breakdowns’ the minute we’d moved house, the time came to roll up my sleeves and have a go. First on the list was a faulty oven – the fan worked, it just didn’t get hot. I concluded the oven element had probably gone so got the oven model number, tracked down an online spares shop and ordered a new element. While I was waiting for it to be delivered, I watched a few how-to videos and read a few reports of similar repair jobs. When the element came, I felt confident enough to have a go at fitting it – a simple case of unscrewing the back of the oven, unscrewing the old element (which had indeed gone) and fitting the new one in reverse. Cost £37.00 (in parts) and an hour of my time. Next came the Dishwasher on which the door latch decided to break and lock all our dirty crockery inside. Again, a little online searching, ordering the new door lock and inner handle (I checked to see if I could return unopened parts in the event that I didn’t need them), and after a few days wait, spent an hour one evening replacing both parts. Another result for the grand sum of £33. Cheaper than a new dishwasher. I was on a roll so I decided to investigate a light switch that could be difficult to switch off/on. Removing the switch from the wall, I was prepared to take a picture of the back of the double switch socket and go shopping for a new one (they only cost a £5 if that. However, re-fitting the switch to make it safe whilst I went out cured the problem. It could have been plaster bits in the mechanism – who knows. That was followed by a light connected to a dimmer switch. It just refused to turn on one day and despite swapping the bulb with a known good bulb, had no effect. So the fault was either with the fitting or the switch. Since I knew that dimmer switches could (and do) malfunction, I started at the switch. Being a single switch, it was easy to follow the wiring to the two terminals and fit a new standard on/off switch. Cost £0.59 for a new switch. With any electrical work, it’s crucial that you isolate the electricity supply at the fuse box before attempting any work on fittings or in the case of appliances, make sure they’re disconnected from the electricity supply before removing any covers etc. Many ‘fitted’ kitchen appliances may have their own fused socket and switch rather than a standard mains plug. Check you have isolated the right supply before starting. When our electric heated towel rail stopped heating (in the very depths of the icy, snowy blast), after checking with a borrowed voltage meter (and the instructions on how to use it properly) I determined that the timer clock had blown. I bough another one (of the same type) and followed the wiring of the old one to replace it. The towel rail still didn’t work though so another check with the voltage meter on the wiring the other side of the timer showed the timer was working so the element inside the rail itself must have gone – and probably took out the old timer as well judging by the soot on the back of the old timer connection pin. Cost of parts £40 compared with £400+ for a replacement towel rail. Identifying the model number, and ordering the part online, fitting was a case of brute force and the right spanner and was as easy as changing a lightbulb. Re-connected the wiring and hey presto, warmth! As per the instructions that came with the new element – remove the towel rail from the wall and turn upside down to remove and refit the element as they’re usually filled with a fluid mix at the factory – not just plain water! The old element was certainly gummed up so it was handy to have a bowl/plastic bag handy to put it in. Very often the thought of doing something and the imagined horrors of it going all wrong can be enough to put most off, but take a deep breath, take your time, do your homework and if does get too much, then at least you’ve had a go. My top tip – take plenty of before photo’s (mobile phone camera’s are brilliant for this) as a visual reference to what goes where and pay particular attention to labelling wiring if you have to disconnect any. If you need to consult a spares shop, then your phone photo’s should be a big help in identifying the right part / number of connectors etc. Try and get one of any serial or model / part numbers and ratings etc too. The trick is to realise when you have gotten too far into a project without having the know-how to complete it and calling in the professionals, before you do more harm and incur more costs to put right your own efforts. Jobs like fitting a new kitchen – building cupboard carcasses may seem simple enough but fitting it so that the new kitchen looks like it fell off the pages of a glossy brochure can be an art – especially when faced with uneven walls and floors. Certainly, any gas plumbing work should be carried out by a Registered engineer/company and you may find that electrical wiring work needs to be carried out by an approved tradesman in order to comply with your insurers. You’d be amazed (well maybe not so) how many people start a fitted kitchen project before getting stuck and coming to Kitchen Quoter. What DIY project or repair are you encouraged to have a go at yourself next? OK, I totally agree that guys these days are a lot less handy around the house. But many's the time I have had a crack at a job and just realised it would have been so much less hassle, and a better job, if I'd called someone in. Previous Previous post: The 16th comes after the 15th – not the 17th! Next Next post: Should I wait for the Government review before installing solar panels?